PULLMAN, Wash. – Washington State University will increase the number of students who study abroad from about 750 per year to 1,000 over the next five years. It is part of a nationwide initiative to equip them with the international experience necessary for success in a globalized world. WSU has launched a 5-year plan identifying four strategic areas for increasing the number of students participating in education abroad: expanding opportunities, encouraging commitment from colleges, increasing funding and eliminating barriers. Fewer than 10 percent of U.S. college students study abroad during their academic career. WSU sends approximately 3 percent of its students abroad each year. 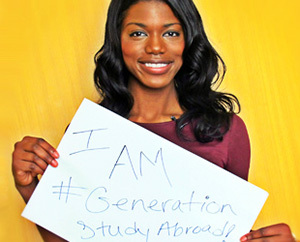 /Generation-Study-Abroad) aims to double the number of U.S. students who study abroad by the end of the decade. The IIE is a U.S. nonprofit founded in 1919 to advance international education and access to education worldwide. WSU is among the lead partners who have committed to specific, measureable actions that will help the IIE reach its goal. Learn more about WSU’s commitment at http://ip.wsu.edu/global-learning/GSA.html. “Committing to Generation Study Abroad speaks to Washington State University’s goal to provide all students with transformational experiences that prepare them to lead and excel in a global society,” said WSU Provost Daniel J. Bernardo. Among other initiatives, WSU International Programs plans to increase the number of scholarships for students studying abroad, including Gilman scholarships to diversify the types of students and the countries they visit. In 2013-14, 742 WSU students went abroad on educational activities to enhance their global outlook and expand their overall experience. International Programs also actively engages students in global learning through the Global Leadership Certificate and Global Case Competition, which emphasize global citizenship as essential to their WSU experience.